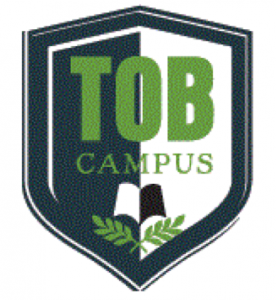 You Can Become a TOB Campus! What is a TOB Campus? 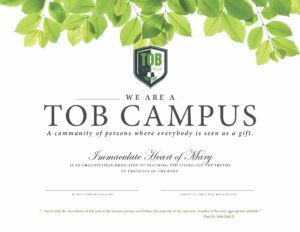 A TOB Campus is a community of persons where everybody is seen as a gift. It’s where the teachings of St. John Paul II’s Theology of the Body take root and begin to flourish. When we live according to our essential meaning as gift, sharing Christ’s love in all that we do, we cultivate a campus life together rich in spiritual fruits such as “charity, joy, peace, patience, kindness, goodness, generosity, gentleness, faithfulness, modesty, self-control and chastity.” (CCC 1832 and Gal 5:22-23). These fruits are the core of change in your school, your community, and ultimately the world. There are lots of ideas on www.tobcampus.org outlining the 3 simple steps it takes to become a TOB Campus. Becoming a TOB Campus is a culture-changer — not only for your students but for your staff as well. It first starts with prayer and guidance from the Holy Spirit, which will help you on the journey. Followed by a decision among all leadership, and engagement of your entire staff. TOB Campus hinges on the cooperation of the entire body. Go to our website for more details, to register your school, and download the materials. There you’ll find pointers on wording and language to use for communication to staff, students, and parents. We offer a vision to transform your school, to make saints, and to change the world. Are you up for the challenge? Are you hungry for the reward?